Home / News / New year fireworks. 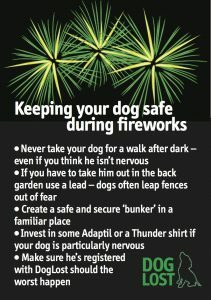 DogLost is preparing itself for a busy period with the inevitable New Years eve fireworks. “This is simply not the case anymore. Dogs, especially those running scared, can cover a lot of ground and could travel into another county. Sadly, we also have people who may well pick up a stray dog and keep it for themselves or move it to another a part of the countrty. If only we could get everyone with a dog to read and think about this and even for just one moment imagine the agony and heartbreak of losing their pet. Please read and heed all of the above and keep your pets safe! Shared to Dog Lost Surrey, South London and West Midlands FB pages. 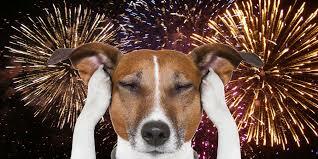 Please join the FAB Firework group if you want to help put a stop to unwanted Firework noise.